...but what job do they hate the most??? Getting the scraper SHARP!!! 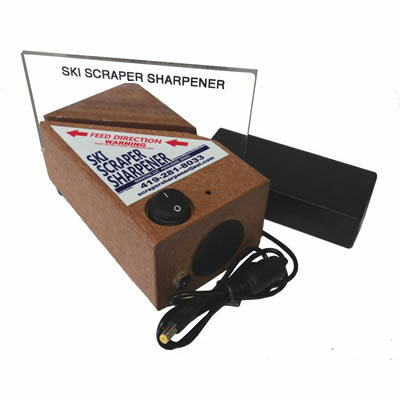 Buy the Ski Scraper Sharpener Now! In a few seconds, by just gliding your wax scrapers through the Ski Scraper Sharpener you can reclaim a sharp, crisp edge - effortlessly, each and every time, wherever you are. The Ski Scraper Sharpener is affordable, light weight, and portable. Whenever or Wherever you need it. The AC Adapter for the back shop, hotel tuning room or at home! With the Ski Scraper Sharpener you can now transform those dull, chipped, or cupped scrapers into sharp, useable tools in just a few seconds. Every Ski Scraper Sharpener is tested at the factory and is guaranteed for 1 full year. If for any reason you decide that the Ski Scraper Sharpener isn't what you expected just contact us within 60 days to send it back for a full refund of your purchase price. This is a tuning tool that you will want in your equipment bag! A Division of Baruch Enterprises.